A little more about me: I'm 27 and I'm an IT engineer in Switzerland. For my job, I speak a lot in English, so I decided to improve my English by comming a few month in Brighton. 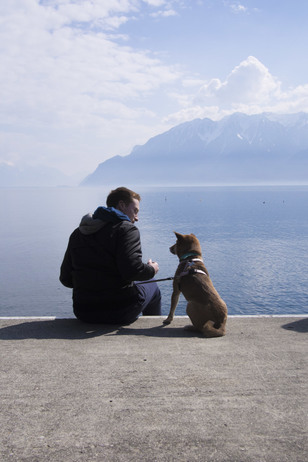 In Switzerland, to have a dog, you have to pass a day test and I have the accreditation to own a dog. I can show you the proof if needed. I also did 6 months of training lessons (using the clicker) with a professional to train Kitsune while she was a puppy. 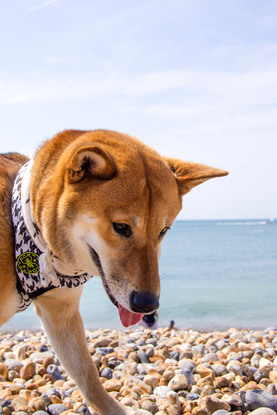 Kitsune and I love to do long walk to discover Brighton & Hove and will be happy to take your dog with us ! She is a really friendly dog and love to plays with other dog. We live in an appartment with a terrace in Kemptown and have an extra room for your dog if he needs to stay for the day. To stay at our place, we would prefer a small / medium dog as it is an appartement. If it is a male, he has to be castrated. My dog walk will be at least 1 hour and it will depend of the weather. If it is a good day to walk (sunny but not hot), it can even become a one day trip (with breaks of course). Around us, there are a few park which are dog friendly and the beach. If your dog is not sick on the bus, we can even take him to join us to a day trip at Seven Sisters for instance. Feel free to contact me if you have questions !